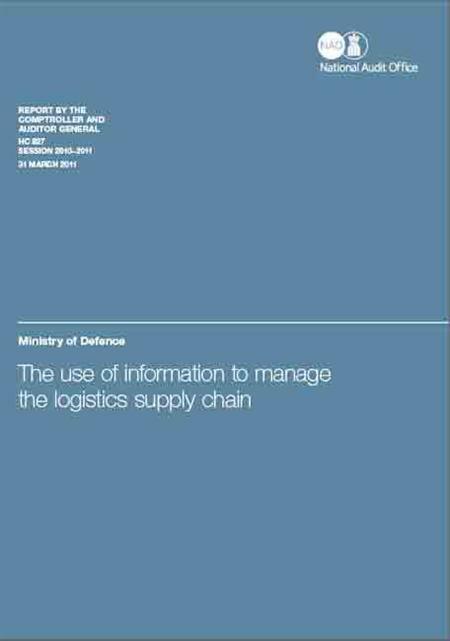 'The Use of Information to Manage the Logistics Supply Chain: Ministry of Defence (HC 827)' details the National Audit Office's (NAO) judgement that the Ministry of Defence (MoD) faces considerable challenges ensuring front line personnel get the ‘materiel’ they need. Despite these challenges, the MoD made 130,300 deliveries to Afghanistan in 2010. Indeed, the amount of time troops wait for supplies has declined since the NAO’s 2009 report on support to high intensity operations. However, the MoD is still not meeting its own performance targets. Highest priority items sent by air should arrive in theatre within five days: in 2010, this was achieved in only around a third of cases. Failure to deliver the right items on time is primarily due to items being unavailable for transport. This means that either the MoD is not accurately forecasting usage and repair rates; or suppliers are unable to respond to demand. Moreover, the MoD is unable to reconcile coherently the information it does possess on the location of its assets and its inventory and supply chain costs. One consequence of this lack of information is that more material than necessary is being sent by air, including many items which have predictable demand. While surface routes are not suitable for all types of equipment and can carry greater security risks, at least 90% of total transport costs to Afghanistan comes from air deliveries - transferring just 10% of items sent by air to Afghanistan to surface delivery routes would save an estimated £15 million per year.